It all started in 1999 with a Team of experts of African cultural heritage and contemporary creativity in search of new ways and ideas of showing Europe the richness of the contemporary African cultural environment. An environment that takes us far beyond the usual idea of Africa as just a continent in need of help, funds and assistance, to overcome the traditional stereotypes of wild safaris, touristic art and “tribal” communities. 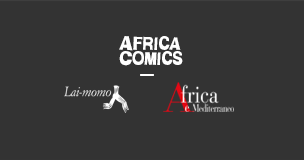 With that in mind, Africa e Mediterraneo and Lai-momo – two organisations working on the research and development process of African contemporary cultural movements – decided to focus on one of the most expressive and globalised forms of art from recent decades: comics. We then started to establish partnerships, involve African cartoonist, develop projects and share ideas that culminated in the “Africa e Mediterraneo Award for Best Unpublished Comic Strip by African author”, a Pan-African competition that in 6 editions between 2002 and 2015 helped to launch new authors and spread African comics worldwide with exhibitions in Bologna, New York, Brussels, Maputo and Dakar – to name just a few. As part of the numerous initiatives with African comics carried out over the years we have received, acquired and collected a large number of original comics, drawings and publications. The catalogue now consists of more than 2500 drawings originating from almost all African sub-Saharan countries and now represents one of the richest collections of African comics in the world. The physical collection is stored in our Study Centre in Sasso Marconi (Italy) and is open to academics, students and experts who wish to view the original drawings for study and research purposes. If you wish to visit please email progetti@laimomo.it and request an appointment. We will respond to your request as soon as possible and arrange the visit. This capital of images, stories and thoughts – built thanks to the contribution of many African comics professionals – can be an important tool for studying and understanding Africa. We have decided to make it available online as we think it could be very helpful to scholars, academics or to people who are simply interested. The online database that you find on this website contains most of the drawings found in the physical collection. Using it is relatively easy: just type a keyword into the search bar and you’ll get results containing that specific keyword. You can also refine your search by adding the author’s name or country under the section “filter”. We hope you enjoy it!